The Transiberian Railway. The construction of the famous Transiberian Railroad begins crosses all of Russia, from Moscow to Vladivostok, as well as the Transmanchurian and Transmongolien that connected Beijing to Moscow. Great map. Relatively difficult but not frustrating. I’ve finished it with 14 years remaining on financier but it was very tense. Money is easy and the trains get faster but the requirements are huge. You better keep your eye on the tasks and start them ASAP. Lots of fun. Sweet Judas I LOVE this site… never seen it before today. HURRAH for trains… HURRAH for geeks! Really interesting map. Finished the first era in Robber Baron in my 3rd try, with literally no time remaining, the last passengers arriving just in time to Vladivostok and me having to sell some tracks to build the last terminal in Moscow. About to attempt the second phase, the obvious challenge being bringing enough oil and wood to Vladivostok. The mapper just misspelled Russia. Nothing special or surprising. Such a fun map, great work. However, I can’t seem to grow Vladivostok to where it needs oil, nor is there any industry that requires oil. Am I missing something? sennaspirit, Its has been a while since I played this map, but I took a look at the xml files. The only demand for oil that I found is the refinery in Moscow. There are 6 city sizes, but none of them demand oil. You should be able to build/buy your own refinery in any city with an “empty lot”. Click on a city, then click on “empty lot” if one is available and see if the window that pops up shows that you can build a refinery demanding oil. The cost will probably be $500,000. As cities grow more empty lots become available. The game has 2 cities with PowerPlants which normally demand oil, but the author of this map changed that so they only demand coal. Good Luck! 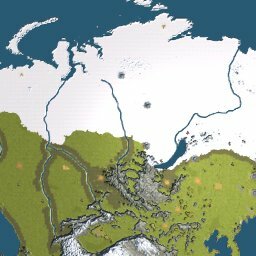 Guys help me create a map and how to do it ? WOW, WOW, WOW…. It was a great map…. Very challenging. You need to pay careful attention ALL the time. Well Done. Fantastic. Took me 5 attempts to crack it. Thank You. Very challenging map, demand very careful track laying. I yet to finish it but got a few question. 1. There’re demand for beer but no factory exist. Does that mean to create one? 2. No city need gold??? Just create gold from ore and no where to send it. Weirdly, the game sometimes picks different industries for the build list. Don’t know why. Install type? Version? etc..? I can build the Refinery on this map. To fix yours, you will need to edit the map XML file called: RRT_Industries_Rusia. Each industry will have a section of code. just below the name of that industry. to be used without the quotation marks. Without them, the line shows up as just: 0. Sorry, the code isn’t showing up here. Have a look at the Power Plant in the file. Copy the line of code that contains bInCity, but use 0 instead of 1. Hopefully you can make it work.